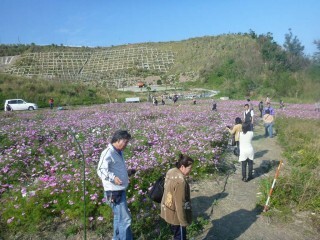 Local residents created the Cosmos flower field after a landslide destroyed the slope in 2006. Central Okinawa is alive with the vibrant colors of flowers in bloom, with more than 100,000 cosmos now in full bloom in Nakagusuku’s Asato district. The flowers are in bloom through January. The excitement of the blooming cosmos is that the flowers are growing on a restored slope in Asato. The area had been destroyed by a landslide in 2006, and residents replanted a 12,000 square meters area with the flowers last October. A Nakagusuku Village officer says the flowers continue to increase. To see the Cosmos, go from Camp Foster’s Legion Gate straight across Highway 330 and turn right toward and past the Okinawa Expressway Kitanakagusuku exit. Continue straight until you hit the intersection with a traffic light. Route 35 veers to the left at the fork.